LEGO Marvel Super Heroes 2 is a tribute to the Marvel universe (minus the X-Men and Fantastic Four for the standard licensing reason) that is unfettered by any movie tie-in. It's given the freedom to create its own unique story, one that is at once Marvel and very much LEGO. If the game has any stars among its cast of hundreds, it's the Guardians of the Galaxy. They are featured in the game's opening level in a battle against the forces of Kang the Conqueror. Just when the Guardians think they have won, Kang manages to avoid total defeat by ripping apart the space-time continuum. Manhattan is transformed into Chronopolis, a crossroads of time and space filled with rips that act as portals to other places and times. This essentially transforms the game into a network of hub worlds, letting gamers spend time completing quests in a medieval kingdom and then jump into an alternate timeline in which Hydra is in complete control of the world. LEGO Marvel Super Heroes 2 gives you a lot of freedom to how you want to play the game. You can stick to the story missions, playing them back-to-back to unlock all of the game worlds, or you can spend time in a newly opened world taking part in all of the activities contained within them. 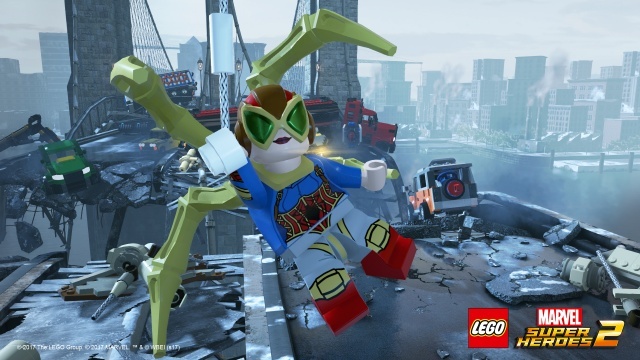 Like previous LEGO games, you can also replay any completed mission with the ability to choose which heroes you bring in, a necessity to get 100% completion on them as certain areas, puzzles, and collectibles can only be opened by specific super powers or character talents. And new this time around are some four-player couch multiplayer competitive mini game modes. These aren't the kind of games that you'll be spending most of your time with when you're playing LEGO Marvel Super Heroes 2, but they are fun to play with friends and family as you unleash your chosen hero's powers on the competition. The actual mechanics of play remains true to the standard LEGO game formula. You bash everything in sight to break things into LEGO bricks and pips, scooping up the pips that serve as the in-game currency. Some of those bricks can then be reassembled into something new, a process that involves simply holding a button down over a highlighted brick pile. It would be nice to see some sort of actual construction element in the game, but the one button thing does keep things simple for kids and does keep the game moving at a brisker pace. There are also some simple puzzles to solve, none of which should give anyone any trouble. Finding some of the hidden collectible items requires a little more work, though, as some of those can be a bit tricky to find and figure out how to get to. It's a bit odd to be smashing everything to bits when you're a super hero trying to save everyone, but it's undeniably fun and while it is a demonstrably repetitive exercise it somehow doesn't feel like one. Even if you play the game on your own, LEGO Marvel Super Heroes 2 is a co-op game, with the AI handling the other heroes if you don't have a friend to join in. The AI is pretty good about being where it needs to be to solve a co-op puzzle, but you'll still be doing just about all of the work yourself. Each level involves from two to four heroes, so even if you're playing with a friend you'll still have the opportunity to switch to a new hero at the press of a button to utilize their unique powers. There is really an amazing number of Marvel heroes and villains packed into this game, and part of the fun of the game is working your way towards unlocking them all. There are also plenty of variants of many of the heroes available, so you'll be able to play as a Spider-Man or Captain America from some alternate comic timeline as well as the more familiar forms. It may be a bit overwhelming if your entire knowledge of the Marvel universe comes from the recent films, but I certainly enjoyed discovering new heroes or variants even if I had to go to a wiki to find out exactly who they were. From a pure gameplay perspective, you've seen most of what is in LEGO Marvel Super Heroes 2 before in previous LEGO games. However, it's a formula that works well and I still had fun with the game even though I basically knew what to expect going into it. I liked the story in this game, it's fun and original, and is packed with that trademark LEGO humor. It's a great game for parents to play with their kids, or for anyone who's a kid at heart. While fans of the Marvel comics will get the most out of the game, it's still a lot of fun for those who don't know every last hero in the canon. 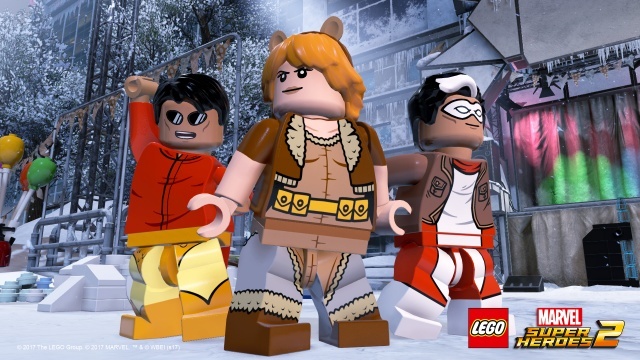 Final Rating: 86% - A lot of LEGO fun with more Marvel heroes than you probably knew existed.